Stephen Whelan (’11) is a competitor. Growing up in Rochester, he honed his instincts on the basketball court. While at Wake Forest University School of Law, he learned to use those instincts in a different sort of court. The Wake Forest School of Law Program in Washington provides students with the opportunity to spend a semester in practice in the most diverse and vibrant legal environment in the world. During the spring semester, Whelan worked as an extern in the litigation department of the Office of General Counsel at the Washington Metro Area Transit Travel Authority. While at the transit authority, Whelan worked on a variety of cases, including a few slip-and-fall injury cases and one employment discrimination case. In that case the plaintiff, who had already retired from the authority on disability, was back making a different claim in hopes of getting more money from the transit authority. Whelan was first attracted to litigation by his mother’s example. She was a litigator in Rochester and he was interested in hearing about her cases. “I was always surrounded by her lawyer and judge friends and I always admired them,” he said. He found the Washington, D.C, Metropolitan Externship program a great way to put what he learned in the classroom to work. “Wake Forest has done a great job of preparing me for things I’ve dealt with at Metro, but also, there’s no substitute for practical experience,” he said. In turn, he found the classroom component of the externship enriched his work life. The program includes both an externship component and a programmatic initiative that includes conferences, roundtables, symposia, and lectures. For this fan of big cities, who has spent time in New York City and Philadelphia, the externship was also a chance to be part of another big city, one with roots that run deep in the founding of America. Whelan found making contacts, and more importantly, deepening those contacts was easy when he was soaking up the city’s atmosphere, rather than sitting in his apartment five hours away in Winston-Salem. The bonds he formed with his co-workers became an important part of the experience. 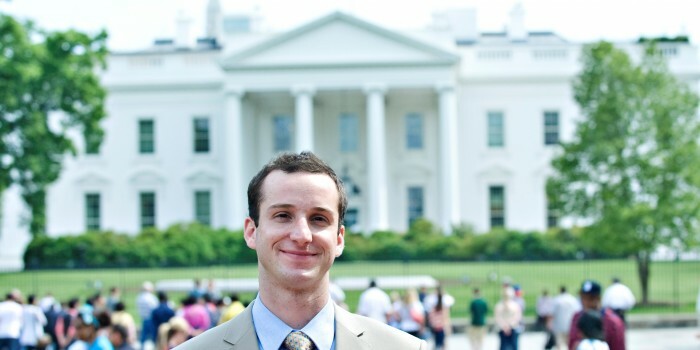 For Whelan, the externship was a chance to try out the future he had begun to map out for himself while in law school.